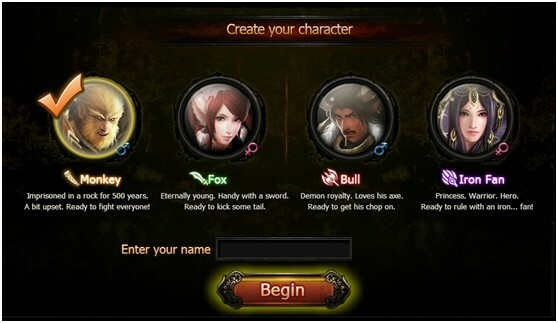 1.When you enter the game, you will have a choice between four different characters. Click the portrait of the character you would like to play--you can choose from the irrepressible Monkey, the cunning Fox, the powerful Bull, or the elegant Iron Fan. 2.You can automatically generate a name by clicking the die or you can type one in yourself. Names must be 6 characters or less.